Power Manager events are typically performed when a specific trigger is detected. The range of available triggers is large and often extended in our free updates, but sometimes it is useful to be able to trigger your events manually. 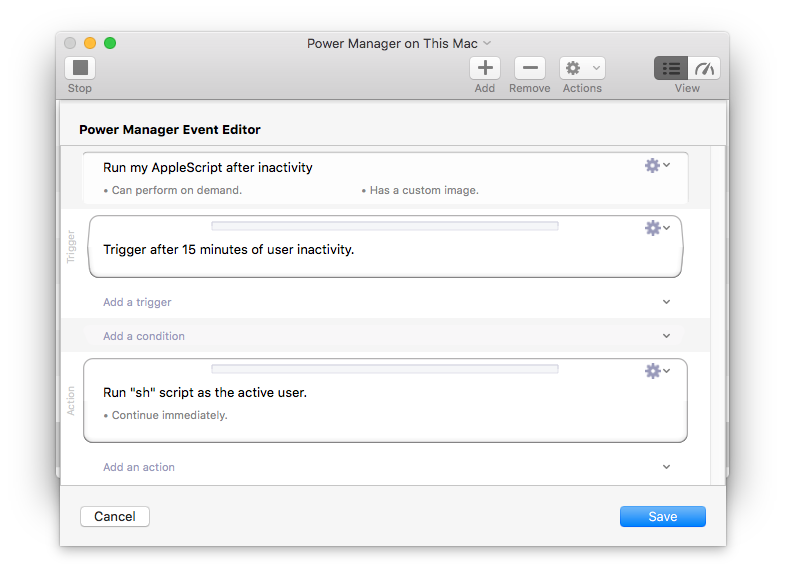 You can trigger or perform events manually in Power Manager. This behaviour is called on-demand in the context of events. An on-demand event is available to trigger whenever you want it. On-demand events appear in a few places. Power Manager's application shows them in the Engine view. 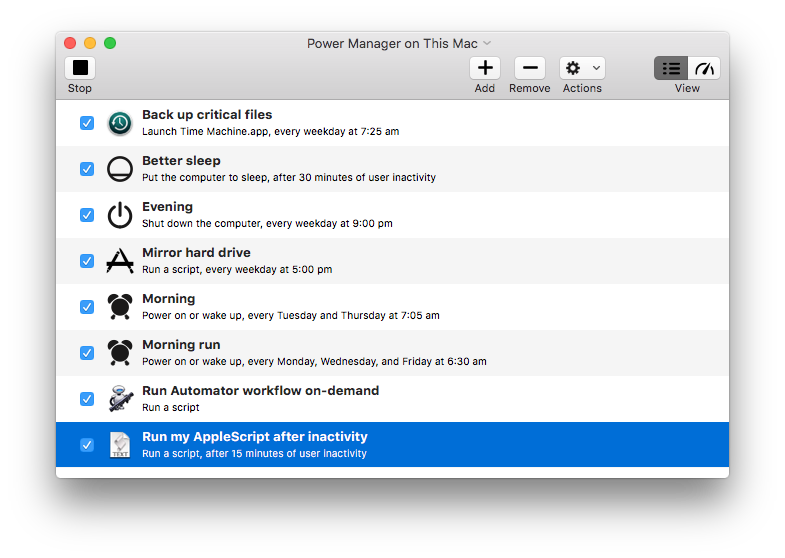 They also appear in the Power Manager menu bar item. In the Power Manager Professional application, on-demand events have their own view. From all these locations, on-demand events can be triggered. Any event can support on-demand behaviour. Perform ignores the event's conditions and immediately executes the event's actions. As most events do not have conditions, the difference between trigger and perform may not be important. Let's walk through adding on-demand behaviour to an existing event in Power Manager. Hold down the Option key and double-click on an event; this opens the event in the event editor. Select Edit from the event's Action (cog) pop-up; this is the top-most block of the event. If Behaviours is not visible, enable Behaviours in the Optional pop-up menu. Select Can Perform On Demand from the Behaviours section. Your event now has the on-demand behaviour added. 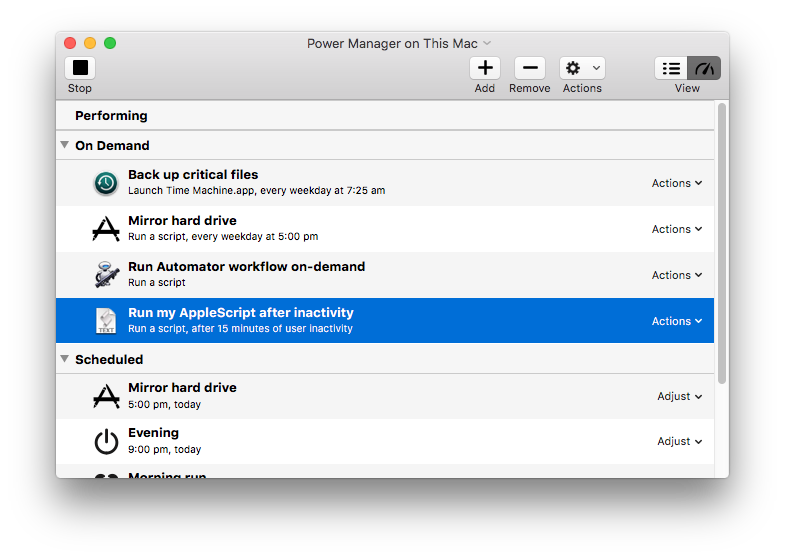 You should now be able to see the event in Power Manager's Engine view and in the menu bar item. If you would like to remove on-demand behaviour, do this by deselecting the Can Perform On Demand in step 5 above. This article was posted in PM4, Power Manager, and Recipe and tagged on-demand, and event.